For those following along, the National Center for Earth and Space Science Education and NanoRacks are reporting that Station Commander Suni Williams carried out all scheduled Crew Interaction Activities for day A+3 at 11:15 am EDT, October 14. One experiment was activated, three de-activated, and two shaken. The SSEP Mission 2 to ISS: Experiment Log was updated yesterday to reflect these activities. Imagine this: Yesterday, Felix Baumgartner set the record for the highest parachute jump, from an altitude of 128,097 ft or 24.26 miles. That’s an altitude equivalent to 4.4 Mt. Everests one on top of the other. He was in fact 40% of the way to “Outer Space”. At maximum speed, he was traveling at 834 mph, or 1/4 mile per second. That’s fast enough to almost cover the height of the Empire State Building every second. Now let’s compare these numbers to the International Space Station – the location of the SSEP experiments payloads. Right now ISS is at at altitude of 250.4 miles. That’s 10.3 times higher than Felix’s jump point, and is the altitude equivalent of 45 Mt. Everests one on top of the other. ISS is orbiting the Earth at 17,150 mph, or 4.8 miles per second – so the astronauts are traveling so fast around Earth that they travel – in 1 second – a distance equivalent to 17 Empire State Buildings laying down end-to-end. To all flight experiment teams and mission patch designers, when your experiments and mission patches are returned to you, consider where they have been. An almost final cool thought: in the time it takes you to read this one sentence, you will be 100 miles from where you started as you and your Earth orbit the Sun. A final cool thought: in the time it takes you to read this one sentence, you will be 700 miles from where you started as your Solar System orbits the center of the Milky Way Galaxy. Throughout human history, bacteria and disease have been prevalent in every civilization. Modern medicine took its largest leap with the discovery of the first safe antibiotic: penicillin. As the world’s nations begin eyeing the depths of the final frontier, they must ensure the safety of the pioneers sent into space. Aboard the Apollo 13 mission, Fred Haise was infected by bacteria known asPseudomonas aeruginosa, which survived in the water tanks aboard the space shuttle. P. aeruginosa is capable of living in nutrient deprived places, like dirt and distilled water, and is deadly to those with compromised immune systems. Its deadliness is not scientists’ only concern; P. aeruginosa is resistant to many common antibacterial agents, penicillin being one of them. Now that space travel is becoming more common, we must take more precaution to ensure the safety of our astronauts from the smallest of killers. By growing two samples of P. aeruginosa, one in space and one under the influence of gravity, and submitting both to various antibiotics, we are able to measure the antibacterial resistance of both cultures. The zones of inhibition, where the bacteria are unable to grow due to the antibacterial agent, accurately show how resistant P. aeruginosa is to each antibiotic. Any variation in the zones of inhibition of the same antibiotic between cultures would be due to any changes that occurred in the bacteria’s resistance when grown in space. Co-Investigator Ryan Puri, now in 11th grade, was down at Kennedy Space Center representing his experiment team – Principal Investigator Martin Liu, and fellow Co-Investigators Kristie Liu and William Tam – when their experiment first launched in May 2012 on the first flight of the Mission 1 payload. 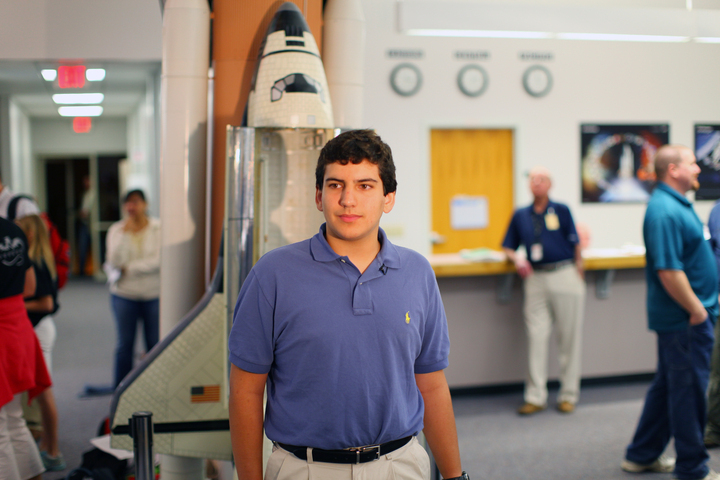 Ryan was one of the SSEP Student Researchers at the NASA press site and was interviewed by NASA. Future American researcher Dr. Ryan Puri is pictured above at the press site.